Almost after four decades, today was the day of Ramponkar, Goa’s traditional fishermen, who overscored the mechanized boat owners, who now use LED lights for fishing at the cost of traditional fishing. 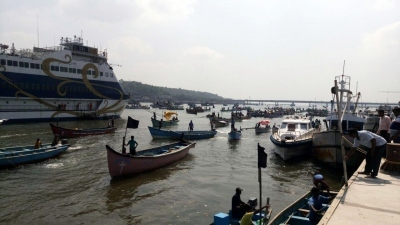 The Ramponkar showed their strength in hundreds, spreading out their canoes in the River Mandovi, forcing the pro-trawler government to act against the LED fishing. Goa’s BJP government tried to pacify them, by issuing a notification last night, banning use of LED lights for fishing and even sending helicopters and Cost Guard vessels to guard against LED fishing. “Take action against them and then we’ll move”, said Agnelo Rodrigues, president of Goenchea Ramponkarancho Ekvott. They have decided not to move from River Mandovi until they see government actually acting against the erring fishing trawlers. To display their plight, they even acted bagging in front of the fisheries department, holding coconut shells (kotti) in their hands. Chief Minister Laxmikant Parsekar appealed to them while speaking at a function held at EDC house today morning. Later, fisheries minister Avertano Furtado came to assure them about action. Minister Alina Saldanha, wife of late Matanhy and founder leader of Ramponkar, also came personally to intervene. But they continued shouting slogans against the government inaction, holding black flags. The agitators also included women and even small children. It was a unique protest by Goa’s traditional fishermen, gathered in Panaji from Canacona to Cutbona to Vasco, recalling the days of ‘70s when it was a force to reckon with. Today, they reestablished themselves once again while election is hardly few months away. The government had no choice but to surrender.